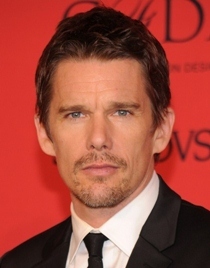 Ethan Green Hawke is an American actor, director and writer born on 6th November 1970. As a child, Ethan aspired to be a writer, but later on developed an interest in acting. He used to perform in several stage plays during his school days. Hawke made his feature film debut in 1985 from the science fiction film Explorers and a few years later he received a breakthrough role in the drama Dead Poets Society. Following the film, Ethan earned variety of roles in numerous successful films including Reality Bites, Before Sunrise and Before Sunset. In 2001, Hawke received the nominations of Academy Award and Screen Actors Guild Award against the role of a young police officer in the film Training Day. His other major films included Boyhood, Regression and Before the Devil Knows You’re Dead. Hawke won several accolades and nominations throughout his career such as Satellite Award, MTV Movie Award and Hollywood Film Award. In addition to that, he as well directed two films, a documentary and three Off-Broadway plays. Being a writer, Ethan wrote two novels entitled The Hottest State and Ash Wednesday. Philanthropically, he always involved in charitable activities and has been a supporter of the Dow Fund since a long time which purpose is to obtain employment and housing for homeless people. As for his personal life, Ethan Hawke married twice. Firstly with actress Uma Thurman in 1998 but the couple got divorced in 2005. Afterwards, he met Ryan Shawhughes and they became married in 2008. The actor Ethan Hawke body measurements complete information is given below including his weight, height, chest, waist, biceps and shoe size. Ethan is a “Star Wars” movies fan. He made his stage debut at the age of 13. According to Hawke, his best experience in Hollywood is “Training Day”.